I love it when someone creates or invents or thinks up something unusual as a home project or solution to a problem. It can often lead to a more creative space. Off-beat, not the usual, something meant for one thing but used for another, that’s what adds personality. I NEED a stair railing on my wall where I have three short steps. Everyone holds onto the wall and leaves fingerprints. But I DON’T WANT a stair railing. A friend suggested two boat cleats with heavy, fat boat rope tied between. My house isn’t nautical although the idea might work in a bathroom for holding towels. For that I cut a long wooden dowel the length of the bathroom wall. Once stained or painted secure to the wall with brass ends from the hardware store. 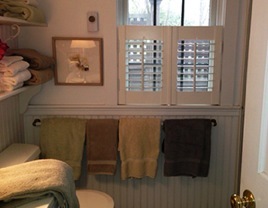 It’s better than a towel rack- holds more towels and looks good. Do this outdoors for holding beach towels. No eyesore for the neighbors to complain about. Like hanging towels over a porch railing. My friend Liz hangs her sheets on a clothesline. Remember those? I want one. Can’t you just see that passing in the Historic District! Back to the stair railing…Steve and JoAnn Marcoux brought me my favorite Christmas gift last year. When we were all boating last summer I was looking for the perfect piece of driftwood to look like a sculpted railing. I never found it. But they did. Do nothing. Embrace “quiet” space. 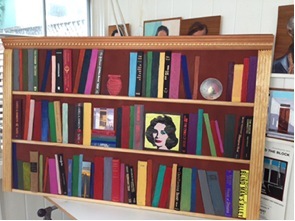 Lynn and Jonathon were inspired by the library used book sale and designed his and her personal trompe l’oeuil bookcases using the spines of the books they bought. I want to do one with my favorite books chronicling different periods of my life. 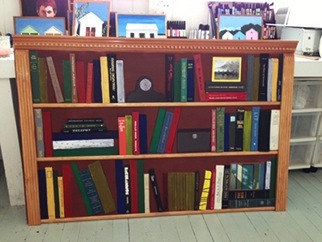 Here are the pictures of the finished projects in Lynn’s studio before they were hung. Trompe l’oeil is an art technique that uses realistic imagery to create the optical illusion that the objects exist in three dimensions. Paint a piece of plywood with latex paint. A dark color is good. 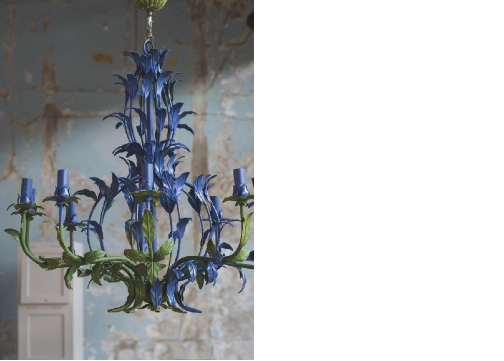 Attach molding to the top and both sides. You might stain it first. Divide the background to create “shelves” and paint the strips to look like the front of shelving. No it’s not wood! Then have fun “arranging” the books and objects on the “shelves”. Some of the books are created with actual spines removed from the books and glued in place. Other “books” are painted. Each artist chose personal objects, a photograph, a picture of a clock or dish or an Andy Warhol like painting and glued it to the background. This project can be any size. Choose the books by color, title, size, subject and have fun making it personal. I’m thinking of doing this in a small bathroom over the toilet from one wall to the other. It’s a narrow space to fill and you wouldn’t actually want a bookshelf sticking out over the toilet. But it is a “reading” room. Kind of a tongue in cheek statement! This is a great way to tell “your story”. It’s like a personal biography of books you love or have influenced you or mark a period of time in your life. Of you might just pick the books for their colorful spines. Lynn says you don’t have to have any special skills for this project.